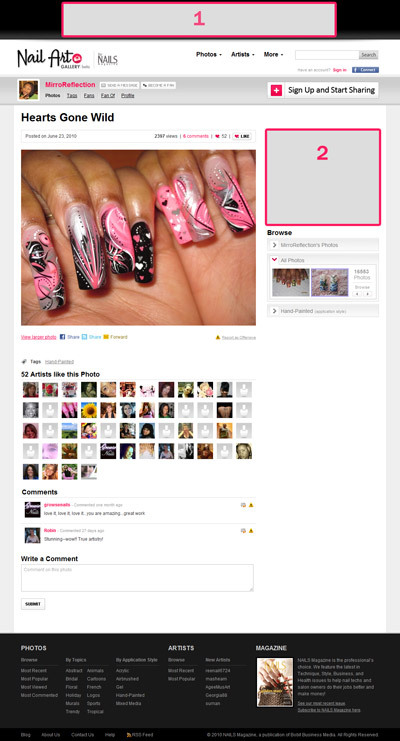 The Nail Art Gallery is kind of a cross between Facebook and Flickr — users can create a personal profile, become a fan of other nail artists, and upload all of their nail art photos in one easy-to-share place. Our original version of Nail Art Gallery was the single most popular section of our website, but we felt it had some limitations. With a monthly average of 2,283,872 pageviews, this new version is much improved, allowing users to tag their photos by the theme or the products they use, and they can browse others’ work easier as well. Advertising in Nail Art Gallery guarantees you maximum online exposure to an active professional audience. CPM rates are available. Click here for full banner specs.